"Entirely green salads are boring!" declared Sarah Jampel in her article, 10 Fruity Summer Salads That Aren't Fruit Salad, a few weeks back on Food 52. At first, I raised a defensive eyebrow—being quite the leafy-green aficionado myself— but was quickly persuaded by Jampel’s critique of the wildly incommensurate amount of leafy-greens plaguing the lunchtime staple. It’s a proportion thing, she argues. "Slogging through a leaf-heavy salad” is tiresome! Here, I have to agree—how many times have I grabbed a salad at my office’s corner bodega or Just Salad (which is now sounding quite ironic) only to embark on a seemingly endless quest of picking through layers of spinach or arugula to mine for that final nugget of bean, chopped nut, or grilled chicken? Too many times, my friend. So, how does one take leave of the leafy-green? Drum roll for Jampel's grand solution…. "Add more stuff." And if you add enough stuff, you don't need leafy greens at all. 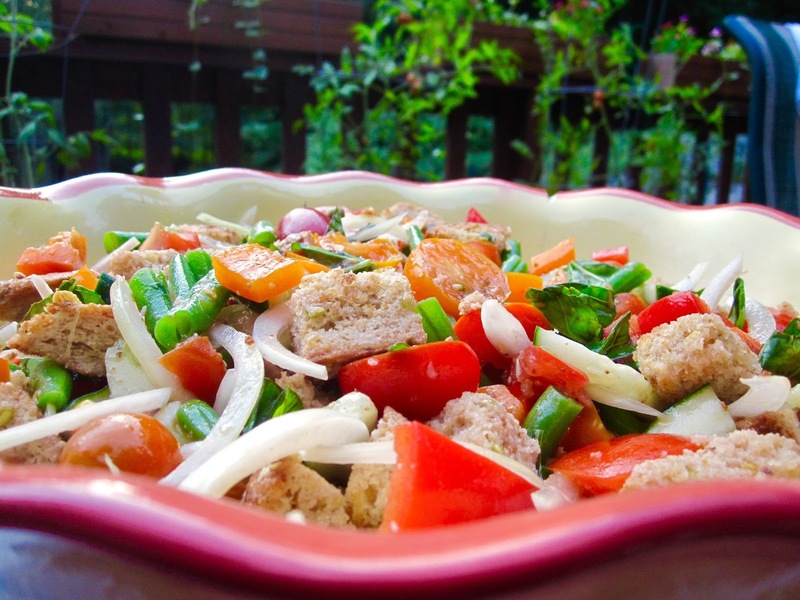 Which brings me to this recipe for Kitchen Sink Summer Panzanella. Farmers markets and backyard gardens are boasting summer produce at its most bountiful, a vibrant rainbow of corn, zucchini, eggplant, and peppers. At first glance, these luscious summer staples might seemed geared only for the grill. 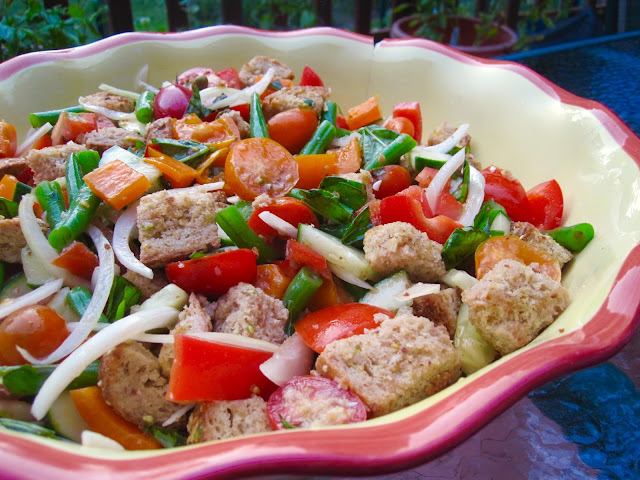 But as a NYC apartment dweller who’s thrown one too many temper tantrums over the balcony-banning propane laws of Manhattan, I challenge you to err on the side of creativity and instead, try a panzanella—a superb medium for these very vegetables that utilizes them in a new, interesting way. Yes, it’s a salad, but gone are the greens. And you wont find any slogging here—rather, be prepared to consume with unbounded zeal and excitement, because you’ve found the answer to late summer lazy dinners: a dish that delivers consistent excellence yet emphatically encourages ingredient versatility. And is really easy. 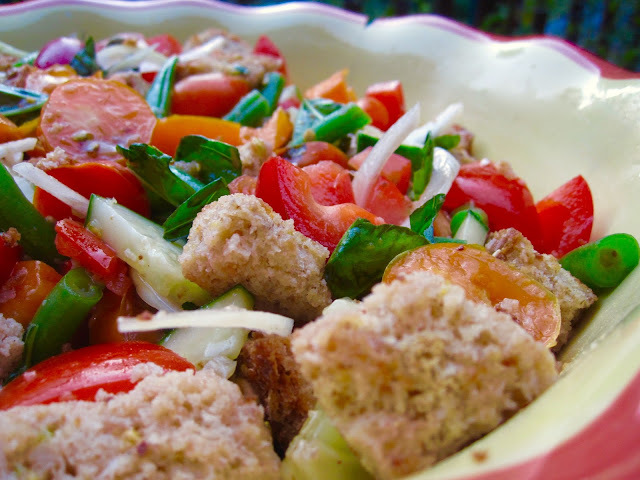 Panzanella is a traditional Tuscan salad that tosses cubes of old bread with tomatoes, cucumbers, onions, basil, and other seasonal vegetables in a classic mix of olive oil and vinegar. It is refreshing, different, and divine. Here, a solid base dressing, enhanced with Dijon mustard and garlic, ensures a fresh, tangy coat to any ensuing ingredient. Briny capers add depth to the raw vegetables and dressing, and toasted, cubed bread doused in olive oil and salt is obviously just impossible to dislike. It all comes together in this crunchy, vinegary, croutony melody of summer’s finest. In terms of vegetables, the market/garden is your oyster! 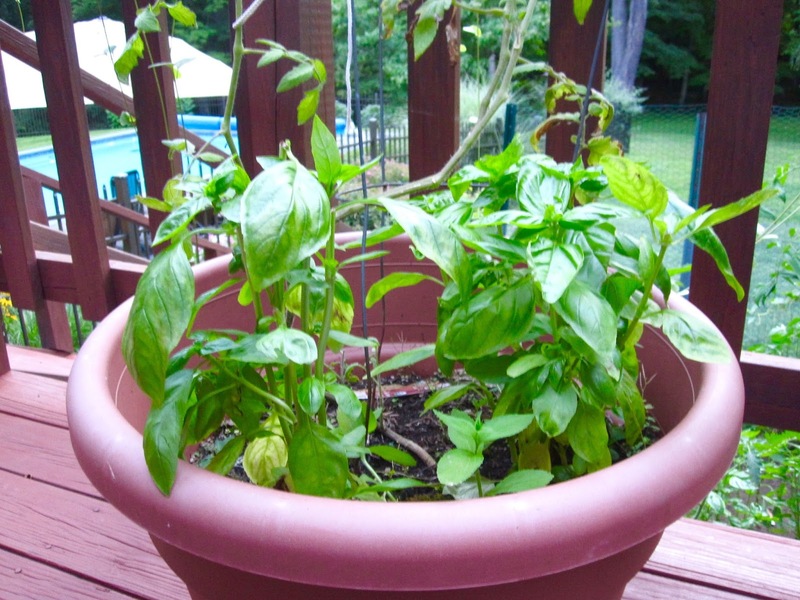 Anything that can be crunched is fair game, though I would always recommend some tomato and basil action. The first time I made this, in went everything I had in the fridge: tomatoes, peaches, string beans, cucumber, yellow squash, and a can of cannellini beans. The next week, I swapped the squash with bell peppers and omitted the beans. Both times, I used whole-grain bread to increase richness and flavor. I strongly encourage you to consider throwing in a diced peach, plum or nectarine to your panzanella—the sweet notes of a stone fruit are a wonderful contrast to the savory salad, yet blend easily with the acidity from the vinegar. To elevate from a side to main, add white beans, diced chicken breast, or tofu cubes for protein. 1. Heat the oil in a large saute pan. Add the bread and salt; cook over low to medium heat, tossing frequently, for 10 minutes, or until nicely browned. Add more oil as needed. 2. Prepare the string beans while the bread cooks. 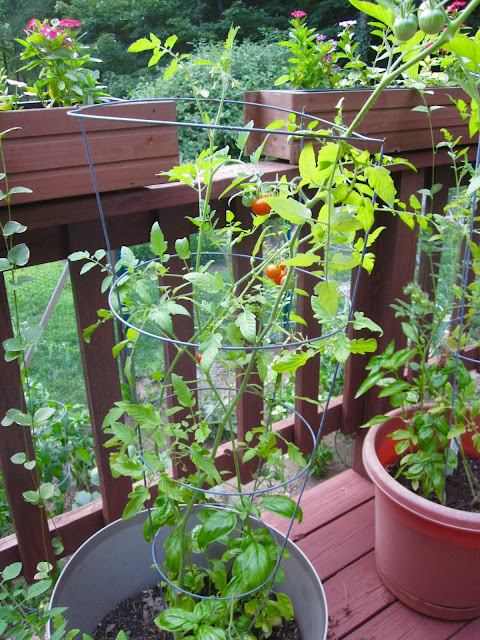 Trim ends of string beans and cover with water in a medium sized pot. Bring to boil. Cook for 3 minutes, then drain and rinse with cold water. Chop into approximately 1½ inch pieces. 3. Whisk together vinaigrette ingredients. 4. In a large bowl, mix the tomatoes, cucumber, pepper, string beans, red onion, basil, and capers (plus any additional fruits, veggies or proteins.) Add the bread cubes and toss with the vinaigrette. Season liberally with salt and pepper. 5. 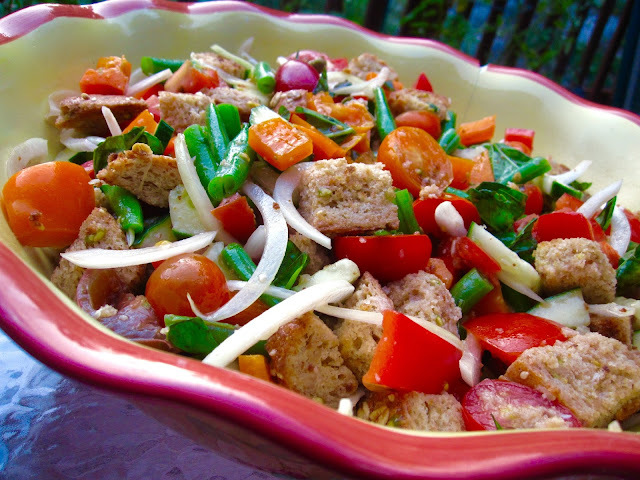 Serve immediately, or allow the salad to sit for about half an hour for the flavors to blend. I've always found it funny that the ubiquitous enthusiasm people have for warm soup on a cold day doesn't translate at all for cold soup on a hot day. For cold soup, the word "cool" can only be applied to its temperature; in terms of trendiness, it sits alone in the cafeteria during lunch—save its super fashionista form gazpacho, which everyone just loooves. But seriously, why must we solely, and selectively, accept the monotony of the tomato base? Is it because vichyssoise is hard to pronounce, and borsht sounds like the Yiddish antonym of mensch? Well, I—unrelenting advocate of all under-appreciated vegetables, and now, chilled soups as well—will not stand for this temperature discrimination. I happen to love all cold soups (hello, green juice in a bowl, people!) And today I will share this recipe for Cold Cucumber Soup with Yogurt and Dill to prove my point. "Summer afternoon, summer afternoon; to me those have always been the two most beautiful words in the English language," Henry James once said. Let me tell you, this is the soup to serve on that summer afternoon. It is the epitome of refreshing, easygoing, insouciant. Cucumbers, summer's most cooling vegetable, veg out on a pool float in a sea of creamy Greek yogurt, peppered with a plethora of verdant, flavorful herbs. Lemon juice lends an easy acidity; olive oil, a grassy twang. The whole thing can be assembled in less time than it takes for your sunscreen to soak in. Prior to serving, top with a quick sprig of dill, handful of minced purple onion, and drizzle of golden olive oil and you've added a complementary rainbow of bright summer hues to the minty green speckled broth. Here, a big batch works best—you'll be surprised how quickly your bowlfull will empty, once, twice, even three times. Stick extras in the fridge and work on it for the week: a big, giant bowl of cool whenever you feel so inclined. If you are like me, this guy will make it into the steady rotation of gazpacho substitutes, earning some well-deserved popularity as we glide languidly into the depths of summer. 1. In a blender, combine the chopped cucumber with the yogurt, lemon juice, shallot, garlic, dill, parsley, tarragon and the ¼ cup of olive oil. Blend until smooth. Season with salt and white pepper, cover and refrigerate for at least 8 hours or overnight. 2. Season the soup again just before serving. Pour into bowls. Garnish with the finely diced cucumber, red onion, dill sprig, and a drizzle of olive oil to serve.